Broken Bag Indicator, PBI-1 offered by Para Electronics, is suitable for Fluidized Air Bed Dryers used in Pharma and Chemical Industries. PBI-1 works on tribo-electric principle. 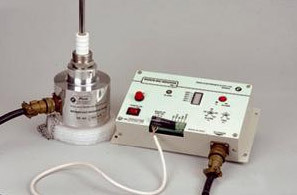 Current pulses generated due to the impact of powder leak, are sensed by the probe unit mounted in the exhaust duct .These input pulses are converted in to 4 to 20 mA output. The Readout unit displays the current value in % on a Bar Graph Display. 4 to 20 mA output and potential free Alarm Relay Contacts are available for PLC operations. To avoid false alarms and to detect genuine broken bag, time delayed alarm circuit is incorporated in the readout unit. Delay time is adjustable between 7 to 70 seconds. Self diagnostic current input signal is internally fed to the probe to continuously monitor the reliable functioning of the Broken Bag Indicator. The distance between the probe unit and readout unit can be as long as 20 to 25 meters. Para Particle Aerodynamic Size Separator Model PPASS-01 is designed and developed for measurement of the size distribution in a host of applications such as pollution and atmospheric studies, inhalation hazard evaluation, characterizing lung delivery systems, material synthesis, etc. PPASS-01 is based on the principle of inertial impaction and separates particles according to their aerodynamic diameters in the range of 0.53 to 10 m in seven class intervals. It has a special feature that it can be used with the number of stages less than the maximum of seven. PPASS-01 is manufactured under license from Bhabha Atomic Research Centre, Mumbai. The design/technical knowhow transferred to Para Electronics- Manufacturing Division of Electronic Enterprises (India) Pvt. Ltd., is the product of developmental work by Environmental Assessment Division of BARC. The PPASS-01 is useful for occupational monitoring of radioactive and non-radioactive environments, arising in the context of material processing, metal cutting, powder handling, etc. It is useful for air quality regulators as well as for researchers engaged in various aspects of air pollution and aerosol research. It can also be used by the pharmaceutical industries for characterising the lung aerosol delivery systems such as nebulisers and metered dose inhalers. 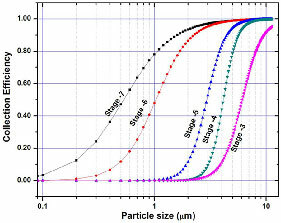 The adjoining graph shows the response functions for the impaction stages of PPASS-01 indicating the collection efficiency variation with particle size. To standardize cut-off characteristics, a very simple and easy calibration method using well characterized, nebuliser generated polydisperse aerosols has been evolved. Each unit is tested for its stage response as per BARC test procedures. 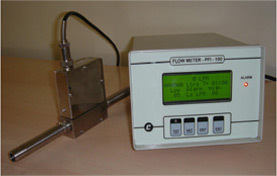 Model PFI -100 is designed for measurement of air flow in the pipes for industrial applications. 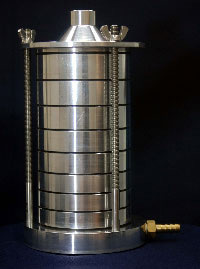 It measures air Flow in the range of 0 – 100 LPM. Model PFI-100 works on 240 V AC Mains Supply. It measures air flow in ½” dia pipe. This air flow is indicated on 4 x 20 char LCD Display. It also generates 4 to 20 mA output signal, linearly proportional to air flow in LPM. Low and High level alarms can be set within the full range of air flow. Air flow totalizer is also provided to integrate air volume in Liters for the preset time. Model PFI-100 sensor circuit housed in the probe unit, is a robust, all solid state device working on Kings law. The length of interconnecting cable between probe unit and readout unit can be 3 meters long. Necessary ½” pipe couplings are provided to enable user install the probe in the air line.